Alexander died before 1854 (as his wife was a widow and remarried in 1854). Ann died before 1854 in Scotland. [S118] Census - 30 Mar 1851, UK census, Scottish GRO 355/0A 010/00 012. [S917] GRO Scotland, marriage record, District of Kinloch Rannoch, Statutory Marriages, GRO 367/00 0003. 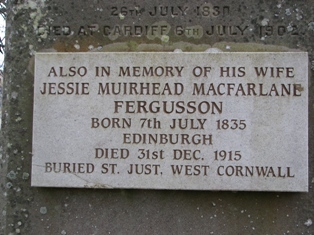 [S565] Cemetery Marker - John Fergusson / Jessie Muirhead McFarlane, Kinloch Rannoch churchyard, Scotland. [S468] Family Tree - Daniel A Cooper, "Family Trees - McGregors by Cooper" , See Note 50. [S917] GRO Scotland, marriage record, Parish of Fortingall, OPR Marriages, GRO 355/0A 0010 0314. [S612] GRO Scotland, birth/bapt record, Parish of Fortingall, OPR Birth/Baptisms, GRO 355/0A 0020 172. [S612] GRO Scotland, birth/bapt record, Parish of Fortingall, OPR Birth/Baptisms, GRO 355/0A 0020 192. [S542] Index - New Zealand BDMs online, at http://www.bdmhistoricalrecords.dia.govt.nz/, Birth Reg. No. 1899/4357 but appears to have been registered as Mary Doris. [S542] Index - New Zealand BDMs online, at http://www.bdmhistoricalrecords.dia.govt.nz/, Birth Reg. No. 1899/4357, and Death Reg. No. 1978/45406 gives this birthdate; daughter of Lawrence Walsh McGlashan and Mary Gabriel. [S443] CD - NZ Marriages, CD - NZ Marriages 1836-1956 V2, NZ Registrar General's Folio 929. [S542] Index - New Zealand BDMs online, at http://www.bdmhistoricalrecords.dia.govt.nz/, Marriage Reg. No. 1921/2889. [S542] Index - New Zealand BDMs online, at http://www.bdmhistoricalrecords.dia.govt.nz/, Death Reg. No. 1978/45406. [S189] International Genealogical Index (IGI), FHL film 442424; p47; Ref. No. 17196. [S612] GRO Scotland, birth/bapt record, Parish of Irvine, OPR Births/baptisms, GRO 595/00 0010 124 FR138. [S612] GRO Scotland, birth/bapt record, Parish of Irvine, OPR Births/baptisms, GRO 595/00 0010 131 FR145. [S612] GRO Scotland, birth/bapt record, Parish of Irvine, OPR Births/baptisms, GRO 595/00 0010 137 FR151. [S612] GRO Scotland, birth/bapt record, Parish of Irvine, OPR Births/baptisms, GRO 595/00 0010 155 FR169. [S612] GRO Scotland, birth/bapt record, Parish of Irvine, OPR Births/baptisms, GRO 595/00 0010 168 FR182. [S612] GRO Scotland, birth/bapt record, Parish of Irvine, OPR Births/baptisms, GRO 595/00 0010 178 FR192. Pamela (Pansy) Gladys McGOWAN was born circa 1899. (Birth date based on age at marriage). [S189] International Genealogical Index (IGI), India Marriages collection, Batch number M75056-1, Record group India-EASy, Film number 528984. [S918] GRO Scotland, death record, District of Old or West Kilpatrick, Statutory Deaths, GRO 501/00 0037, aged 5, mother's maiden name FERGUSON.